There are many ways to do fine work. One approach is to learn to balance creativity, continuous development and contentment. This can be a hard circle to learn, particularly if a person is driven. Creative people love to keep developing. They are often restless and want to get onto the next project. Sometimes they find it hard to appreciate what they have done and enjoy a sense of contentment. It can also be important, however, to rest and revitalise their soul. What to do during this time? One approach is to give themselves permission to be fallow, but also to do things that give them positive energy. This can enable them to gain insights and maybe even come up with new projects. Let’s explore these themes, beginning with creativity. When do you feel most creative? Different people give different answers to this question. Here are some of these. Encouraging people … Writing articles … Cooking nourishing food … Running a workshop … Helping customers to solve a difficult problem … Tackling a stimulating challenge … Walking to work first thing in the morning. Some people believe that feeling creative is something that happens to us. Others say that it is possible to increase the possibilities of enjoying this state and doing creative work. How to make this happen? Here are some questions that it can be useful to ask. You can then act on the answers. 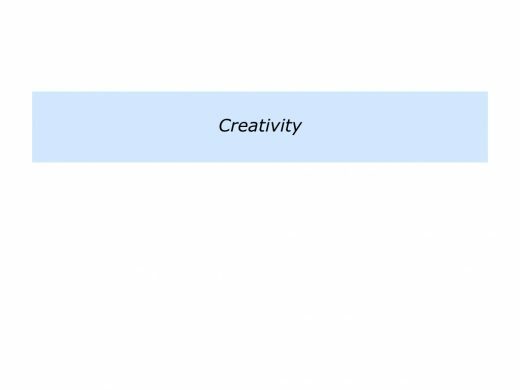 When do I feel most creative? How can I do more of these things in the future? When are my prime times – the times of the day when I feel most creative? How can I protect and make good use of these prime times? What for me are the most stimulating kinds of projects? Who are the kinds of people – such as customers or colleagues – that I find most stimulating? What are the kinds of places – cultures and environments – that I find most stimulating? How can I find or create such stimulating projects? Looking back, when have I done creative work? What did I do right then – what were the principles I followed – to do creative work? How can I follow these principles – plus maybe add other skills – to do creative work in the future? What are the kinds of challenges that inspire me to be creative? How can I find or create such challenges in the future? What will be the benefits – to myself or other people – of tackling these challenges successfully? 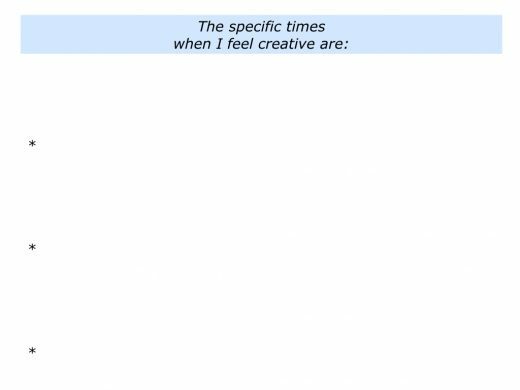 Describe the specific times when you feel creative. 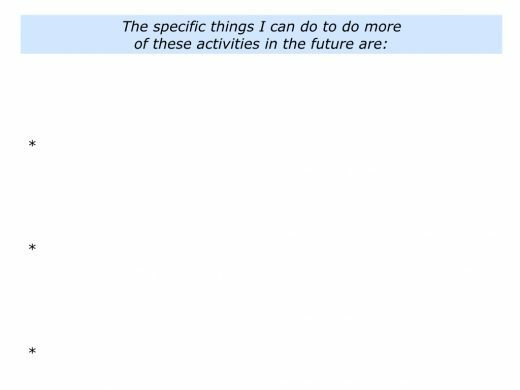 Describe the specific things you can do to do more of these activities in the future. Creative people are often addicted to development. They see finishing as another name for beginning. They love to complete a project and gain a sense of fulfilment, but then the juices kick in again. They want to go on to the next project, the next sense of purpose. This need won’t go away, so how can they channel this desire for development? There are two stages to consider. First, they can reflect on what they have learned and how they can continue to develop. Second, they can make good decisions regarding the next project they want to tackle. Let’s explore these themes. Great workers embody the Japanese concept of Kaizen – continuous improvement. Different people use different frameworks for taking this step. One approach is for them to reflect on the piece of work they have done. They focus on what they did well and what they can do better in the future. They then translate this into a clear action plan. Here is one framework they use. People love to have a sense of purpose. Sometimes this is provided by doing a project they believe in. After completing the work they may feel a sense of elation, but this may be followed by a feeling of emptiness. One approach is to quickly move on to the next project. This can work, providing that the project meets the following conditions. It is one they find stimulating. It is one in which, providing they do their best, they stand a good chance of achieving success. It is one that they really want to do and can respect rather than one in which they may get sloppy. This final point is vital. Good workers respect the challenge they face. They do this whether they are tackling a routine task, turning around a company or climbing a mountain. Some people do not respect a challenge and ‘fall off the mountain’. Imagine that you are exploring a potential project that you believe will enable you to develop. You may have the chance to launch a new business, take over a failing team, lead a customer service initiative across a company or whatever. Your interest is piqued, but you are not sure about tackling the challenge. You want to do satisfying work and have a reasonable chance of success. This calls for doing a reality check before committing yourself to the challenge. So your first task will be to gather information. There are many ways to do such due diligence. One way is to ask questions on the themes of What? Why? How? Who? When? These can be used for researching any potential project. What are the stated goals of the project? What are the real results to achieve? What will be happening that will show we have reached the goals? What is the picture of success? What is actually happening now? What is the state of play? If the project is already going: a) What is going well; b) What can be done better and how? What are the successful and unsuccessful patterns? What are the key challenges I will face? What are the resources I will need to tackle these challenges, do superb work and reach the goals? Why do people want to do the project and deliver success? What will be the benefits of achieving the goals? What will be the specific benefits for the various stakeholders – such as the company, customers, colleagues, community and other groups? What will be the pluses and minuses that I and other people may encounter on the road towards achieving the goals? How can I build on the pluses and minimise the minuses? Looking at the pluses and minuses involved, am I prepared to accept the whole package? How can I do my best to reach the goals? What are the three key strategies I can follow that will provide the greatest chance of success? What are the things I can control on the project? What are the things I can’t control? How can I build on what I can control and manage what I can’t? What are the potential difficulties I may meet along the road? How can I anticipate and prevent these difficulties happening? How can I manage the difficulties if they do happen? What are the things I can and can’t expect from the culture – the organisation or company – in which I will be working? How can I make sure that I go in with my eyes open? What could I do to thrive, rather than just survive, when working in or alongside the culture? What will be the support required? How can I use my own and other people’s strengths to reach the goals? How can I get some early successes? What else can I do to increase the chances of success? Who are the key stakeholders – the people I must satisfy? What is their picture of success? What is their mental model about how they believe people should work in order to achieve success? What do I believe are the overall Dos and Don’ts they ask people to follow? Bearing these things in mind, will I feel okay working with these people? How can I keep them proactively informed about the progress towards achieving the goals? How can I create enough space to make sure I can get on with the job? Who are the people I may need on a team? What are the qualities – the spirit, strengths and skills – they will need to demonstrate? Looking at the people already in the team, it can be worth exploring the following questions. Which of the people already have these qualities? Which people may have the qualities? Which people probably don’t have the qualities? Bearing these things in mind, what are the decisions I may need to take about people? How can I do this in a moral way? How can I employ the right people in the right places in the team? What are the specific results that people in each of the roles will need to deliver? 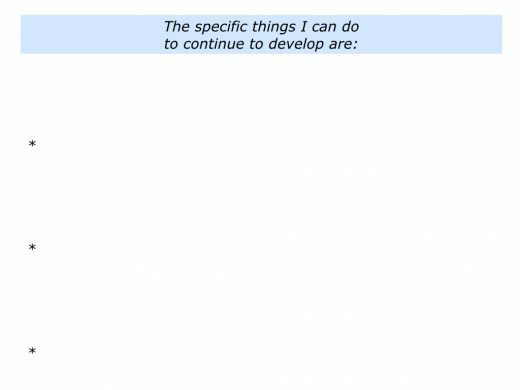 How can I make clear contracts with them about their contributions towards achieving the goals? How can I make sure that people are given the support required to do the job? What are the specific results that must be delivered and by when? What are the key milestones? What are the short, medium and long-term goals? How can I get some early successes? How can I continue to ensure that the project is on track and people deliver the goods? How can I continue to get reality checks about: a) What is working; b) What can be better and how? How can I encourage people on the journey? How can I do everything possible to reach the goals? How can I ensure that people do the basics and, when appropriate, add that brilliance? What else can I do to deliver the picture of success? Imagine that you are considering tackling a particular project. On a scale 0 – 10, how motivated do you feel to tackle it? What could be done to increase your motivation? Make sure the motivation is at least 8+/10. If so, it may be an opportunity that will provide a win for the key stakeholders and a win for yourself. This can enable you to continue to develop. If you wish, try tackling the exercise on this theme. 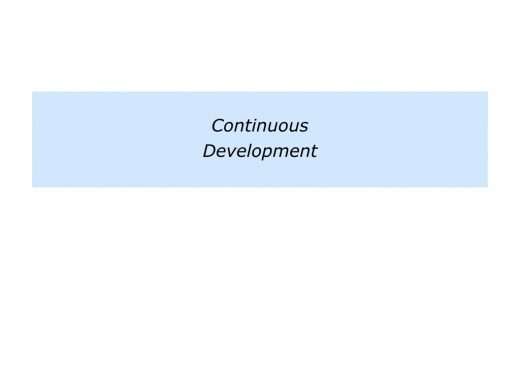 This invites you to describe how you can continue to develop. Creative people love to keep developing. Because they are so driven, however, they may need to create time to appreciate life and enjoy what they have accomplished. There are many views on how people achieve a feeling of contentment. Here are two approaches. Contentment can come from counting your blessings and appreciating what you have in life. This can result in having a sense of peace. Contentment can be the reward you get from continuing to do your best in life. It can come from building on your strengths and feeling you have given everything in a situation. This can result in having a sense of peace. I am sometimes able to sit down and count my blessings. On the other hand, I am also driven to improve. The challenge I have is to know when to focus on each of these themes. I need to get the right blend. Sometimes I need to slow down and appreciate the things I have in life. Sometimes I need to sweat and work to reach a stimulating goal. Creative people can feel contented after achieving a specific goal. They sometimes do this by going into a state of flow. They flow, focus, finish and, as a by-product, find fulfilment. Looking at your own life, when do you get a feeling of contentment? What do you do produce this feeling? You may get it when counting your blessings, walking, gardening, listening to music, cooking or whatever. You may also get it when being creative, tackling stimulating projects, experiencing a sense of flow, performing at your best or whatever. There are many approaches to doing fine work. 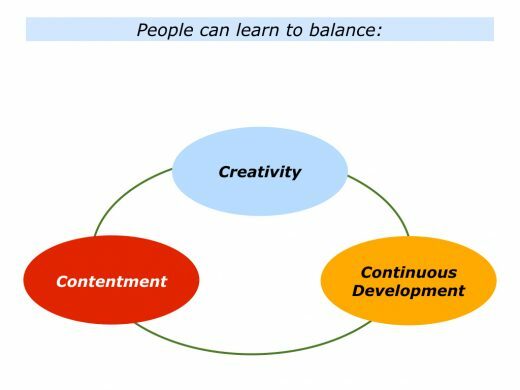 One approach is to get the right balance between creativity, continuous development and contentment. 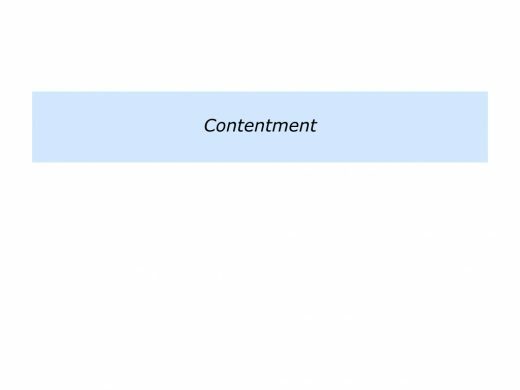 Describe the specific times when you enjoy a sense of contentment. Describe the specific things you can do to continue to enjoy a sense of contentment.